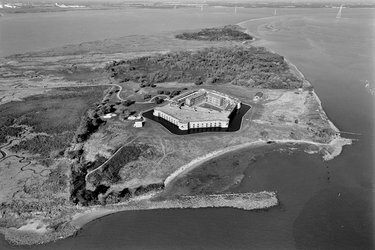 Fort Delaware is located on Pea Patch Island in Delaware and is considered to be a haunted prison. This particular structure is built in a pentagonal manner and reflects that of a military structure. It comes complete with a mysterious dungeon and fits the overall look and feel of a haunted prison. Today, this particular building has undergone restorations and is opened to the public. However, during the time of the Civil War, this was a hot spot for confederate prisoners. During the time of the first and second World Wars, Fort Delaware was used in an effort to defense on the coast. It was in 1951 that it was named as a state park and gained public access. •	In the year of 1985, an individual was touring Fort Delaware and taking a variety of pictures throughout the inside of the structure. Once this individual developed their film, they were quite surprised to see that they had caught an apparition on film! This was of a soldier, dressed in confederate type clothing. The apparition was not solid, but clear enough that the details behind him were clearly apparent. He was photographed standing in the archway of a door, as if debating whether crossing to the other side or remaining. •	In and around the area of this prison where the dungeon stands, many visitors and employees have heard frightening sounds. These sounds reflect that of someone attempting to break loose from chains. It has also been noted that moaning and screams have emerged from this area. •	Believe it or not, the apparitions of pirates have been viewed in and around Fort Delaware. It is believed that when pirates were caught in the early days of the life of the structure, they were housed in this prison. They always had a desire to be free and revisit the ocean, but it seems as if they never were and that their spirits remain on the grounds and in the building of this haunted prison. •	Many unusual sounds have been heard among the many floors of Fort Delaware. Many have recorded cases of the sound of walking, while others have reported violent screams and pleas for help. This haunted prison not only housed the prisoners in life, but it seems to house them in spirit to this day!